April has been a big month – no new lifers (got a nemesis lifer in a Blue-winged Warbler on the last day at Palmyra) but 110 species for the month including 48 FOY birds. It’s starting to get good with migration coming into full swing. My first trip of the month was to old local favorite, Palmyra Cove. I figured that things would be starting to hop there and recent reports indicated a pair of breeding Horned Grebes that I wanted to try to see. I dipped on the grebes, but the day was still a great day. I met up with fellow birder RAY HENNESSEY along the way and enjoyed a little conversation with my birding. Along the way I got a nice chance to watch a pair of Wood Ducks in the remainder of the pond in the former Big Pit, along with some Gadwall, mallards and a single Hooded Merganser. Going toward the “Warbler Pit”, I got to finally see a Eastern Towhee and the forest revealed a Brown Thrasher and several Hermit Thrush. Heading along the back end with Ray and 1 other birder, the birds were plentiful and enjoying the weather as much as we were. Blue-Gray Gnatcatchers and a Yellow-bellied Sapsucker made an appearance as well. An added bonus was seeing the Palmyra beaver for the first time. The following Saturday, I met up with SHAWN WAINWRIGHT, ALYSSA DELLA FAVE and several others for an Ocean County trip. The morning started off well with a pair of Osprey sitting on a nest in someone’s front yard just outside of Belleplain State Forest. Once in the park (at the park office), I was treated to great looks at a host of FOY birds: Eastern Phoebe, Laughing Gull and a pair of beautiful Yellow-throated Warblers, their bright yellow throats shining in the sunlight. We then headed into the park for Sunset Bridge to look for the recently sighted Louisiana Waterthrush. I had thought it would be a lifer for me but it was only a state bird — still, it was a neat bird to see and we thought we actually saw TWO of them. Other highlights in the park were numerous Yellow Warblers, a single Pine Warbler hanging out by the stream under the bridge, a calling Black-and-White Warbler and a number of other birds such as my second Yellow-bellied Sapsucker in a week. From there, we went down to Cape May Point State Park. Again, it was a really great time despite dipping on the EURASIAN TEAL we were seeking there. 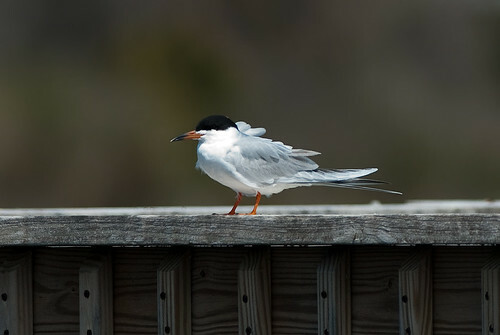 My first terns of the year — several Forster’s Terns with their raucous calls started off the trip (aside from the standard purple martins, that is. Herons and egrets were prominent but the biggest highlights were the 2 rails species we saw/heard: Virginia Rail were heard calling and responded to recordings we played – but we couldn’t find them despite being only a few feet away; in contrast, we got to see a good glimpse of a Sora, a bird I haven’t seen since the Everglades in the late 80’s. As we worked our way along the back of the red trail, we ran into a number of warblers: Orange-crowned Warbler, Prairie Warbler and Yellow-rumped Warblers were all present, and Common Yellowthroat could be heard calling. 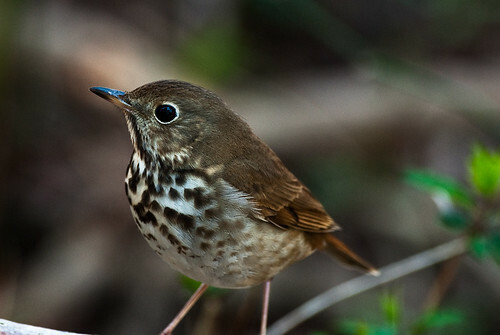 Perhaps one of the coolest things of the day was getting an up close look at this Hermit Thrush. A short side trip to Sunset Beach gave us the normal birds: gannets, cormorants, terns, gulls and a small surprise flock of Black Scoter, but our attempt for EUROPEAN COLLARED DOVE was a miss. From there, it was time to head to Forsythe NWR. Along the way, I was treated to 2 more FOY birds that I don’t get to see very often: Little Blue Heron and a Broad-winged Hawk. 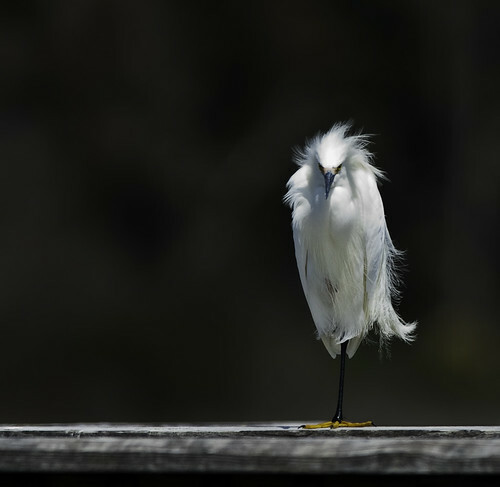 Forsythe NWR was a sight for sore eyes — after Hurricane Sandy, the park has been closed to visitors and had just re-opened. The damage was pretty evident throughout and familiar terrain was forever changed. But the birds were back, even if they might have been a big confused by the alterations to the landscape. 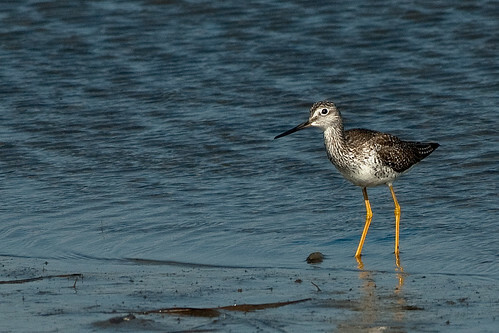 Shorebirds were fairly plentiful, including both Greater Yellowlegs and Lesser Yellowlegs and Willet. A single beautiful American Oystercatcher was ignorant of my proximity and gave me good looks; another pair was found on the opposite side on the dike. Along the wildlife drive, I was treated to 6 pairs of Osprey, as well as both Caspian Tern and Common Tern. 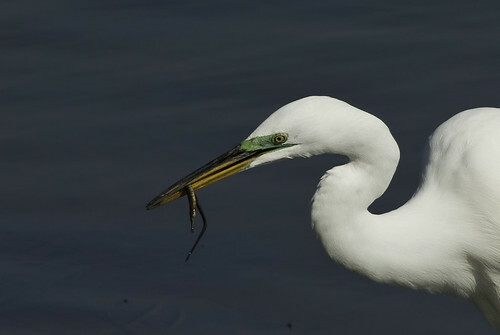 One of the cooler things I got to see was this Great Egret trying to down a pipefish with considerable effort – the fish just didn’t want to go down! Last Saturday, I helped out DAVE MAGPIONG out with his Pledge to Fledge project of a bird walk at a local park which has been closed to the public for years. Walking through this urban park, we were surprised to nail 47 species of birds, total. Many of them are birds I would have not expected to get at the park – including Forster’s Tern, Killdeer and Wood Duck. But I also added three new year species: Northern Rough-winged Swallow, Warbling Vireo and Baltimore Oriole. I actually had a great time helping to lead the trip, throwing in my knowledge when I could. Later, Dave suggested I should start leading some trips which I might actually consider doing at some future time. 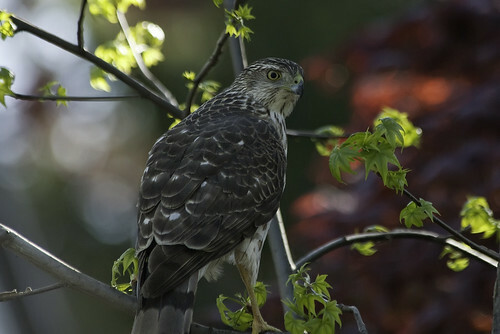 An additional bonus was getting a close-up performance of a Cooper’s Hawk hunting a squirrel in my front yard before I left to meet up with Dave. As I watched it flew to the tree across the street in pursuit of a squirrel. I was running late but I couldn’t not watch this drama unfold. The hawk hopped from branch to branch trying to find the squirrel, who was doing his best to be on the exact opposite side of the tree trunk. The hawk went back and forth and every once in a while would swoop around the trunk and make an attempt at snatching the squirrel off of the trunk. Eventually, the squirrel scurried down the trunk and made a run for it, with the hawk taking off in chase. I watched as both raced around the corner of my neighbor’s house (I think the squirrel escaped). It was a great experience to stop and enjoy instead of racing off (sorry I was late, Dave). So on the last day of the month, I decided to take one last shot at finding some good birds due to the heavy migration from the night before. The weather was a little wet so I was hoping for a bit of a fall-out; I didn’t get it but I still had a great time out there before work. First was a little surprise in my own front yard when I heard a distinctive warbler call. 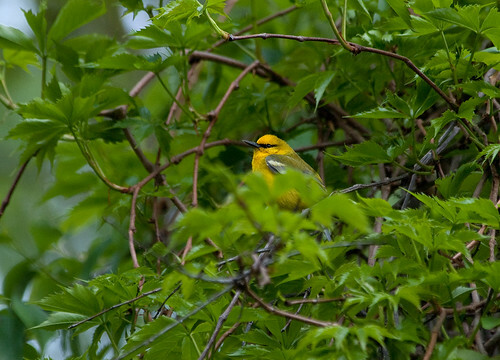 At first I couldn’t identify it but a quick glance with the binoculars revealed the source – a pair of Black-throated Green Warblers coming within a short distance of me. I tried to get some pictures but I’m not sure if the light was with me. Once at Palmyra Cove, I started out along the retention ponds at the front of the park. Many of the usual spring suspects were there – yellow warblers, white-throated sparrows, red-winged blackbirds, Common Yellowthroats. But then I heard a couple of calls that weren’t as familiar. One was a Warbling Vireo, the first of a half-dozen I would encounter on my short hike. But the other turned out to be a long-standing quest finally fulfilled – a nemesis bird that’s been on my Top 10 “To See” list for about 8 years: a lifer BLUE-WINGED WARBLER*. It was only about 5′ from me in a small tree, and then flew right over my head to a short way up in a black willow just above me. I got a lot of great views although pictures were hard to get in the lower light. It was worth it to miss the shot just to be able to admire the fulfillment of a long quest. After it flew off, I made my way around the Big Pit and some of the surrounding woods in order to see if the warblers had descended into their normal haunts. Lots more warbling vireos, yellow warblers and common yellowthroats were waiting for me along the big pit. Further into the woods, I found 3 more FOY birds: a single Northern Parula, a couple of House Wrens and a single Blackpoll Warbler. A bit further in I got a short glimpse of one of the Palmyra foxes – I was hoping to see them and was excited to actually do it, albeit a brief one. The back side of the park was a bit quieter for new species but was chock full of blue-gray gnatcatchers, yellow warblers and white-throated sparrows. The beaver pond was nice as I was treated to 3 swallow species (barn, tree and northern rough-winged) and an eastern phoebe. All too soon I had to go, but that hour and a half was a much-needed respite from work and a boon to my Big Year list. In addition to my birding trips, I’ve gotten to enjoy a new yard bird with a Eastern Wood-Pewee (not what I would have expected in my neighborhood); my morning walks late in the month have produced daily Gray Catbirds and my softball game offered up Chimney Swift. 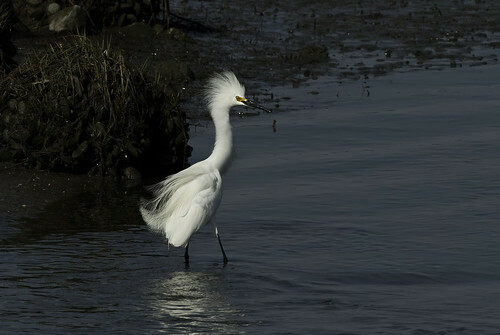 But the coolest sighting wasn’t a year bird but a chance to see life happen in a really cool way. My walking out the front door to meet up with Dave, I spooked a Cooper’s Hawk who was stalking a squirrel. I couldn’t help but stick around and watch as the Coop would hop from branch to branch, trying to keep an eye on the squirrel – which was doing IT’S best to stay on the opposite side of the tree from the hawk. Every so often, the hawk would swoop around the trunk quickly and try to snag the squirrel but it was just a little too slow. After about 3 attempts, the squirrel made a run for it and the hawk was off in hot pursuit. I lost them around the corner, but I think that the squirrel made it. The whole thing was great to see. So my hopes that April would top March were met — including averaging seeing more than 20 species per day through the month. Now I’m excited to see what May holds, including a Friday trip to Cape May/Forsythe, the Delaware Birdathon on 5/11 and hopefully another trip or two (including Garret Mountain).